In October 2016, I attended the Cambridge Rare Disease Network Summit 2016 with Tania. It was very thought-provoking and listening to families’ stories, about gaining a diagnosis for their child was familiar to me. As Tania rightly stated, a child with any medical condition doesn't just have health care needs, but that health, education and social care must be regarded holistically and considered all at the same time. So, for my column this time, I’ve chosen to write about Addison’s disease due to my personal experience with the condition, discussions on social media and to raise awareness. As we all know, knowledge can save lives. On the 1st September 2014, a new duty came into force for governing bodies to make arrangements to support children at school with medical conditions. The guidance was amended slightly in December 2015. Some of the guidance is statutory and some non-statutory. A parent/carer of a child with a medical condition will have concerns about how their child’s medical needs will be met at school. This is because they may require ongoing support, medicines or care while at school to help them manage their condition and keep them well. It’s important to note that the child’s health needs may change over time, in ways that cannot always be predicted, sometimes resulting in extended absences. Addison's disease (also known as primary adrenal insufficiency or hypoadrenalism) is a rare disorder of the adrenal glands. The adrenal glands are two small glands that sit on top of the kidneys. They produce two essential hormones: cortisol and aldosterone. The onset of the disease may occur at any age. Secondary adrenal insufficiency occurs less frequently than primary adrenal insufficiency. It happens when another part of the body is affected by a condition or disease, which in turn leads to the adrenal glands being affected. The most common cause of secondary adrenal insufficiency is when a child develops a pituitary tumour. The pituitary gland is found at the base of the brain, and the tumour may affect the ability of the pituitary glands to produce the messenger hormone, adrenocorticotropic hormone (ACTH), which is vital as it stimulates the adrenal glands into action. Destruction of the adrenal gland due to an autoimmune response is the most common cause of the disease. Some cases of Addison's are caused by the actual destruction of the adrenal glands through cancer, infection (tuberculosis, for instance), an autoimmune process, or other diseases. Where Addison’s occurs in children and teenagers, the cause is usually autoimmune destruction. The loss of cortisol and aldosterone can produce a chronic, steadily worsening fatigue, a loss of appetite, and some weight loss. Blood pressure is low and falls further when a person is standing, producing light-headedness. Nausea, sometimes with vomiting, and diarrhoea are common. The muscles are weak and often go into spasm. There are often emotional changes, particularly irritability and depression. Because of salt loss, a craving for salty foods is common. Darkened areas of skin (pigmentation) and intolerance to cold. Unfortunately, the symptoms can be hard to detect and can resemble other problems or medical conditions. Some children may also experience hypoglycaemia (low blood sugar) which can affect concentration, anxiety and unconsciousness. It’s noted that children with Addison’s disease may start puberty later than usual. 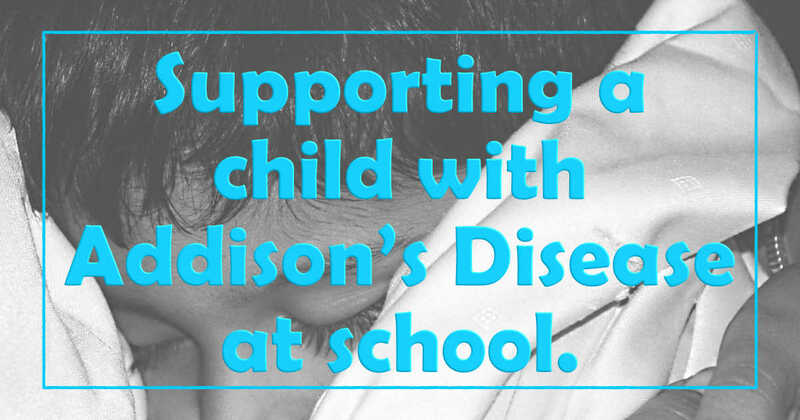 If not treated, Addison's disease may lead to severe abdominal pain, extreme weakness, low blood pressure, kidney failure, and shock especially when the child is experiencing physical stress. This is referred to as adrenal crisis. This is a medical emergency and left untreated it can be fatal. A child with Addison’s disease will be usually be treated with tablets. Hydrocortisone to replace cortisol and or Fludrocortisone to replace aldosterone (steroid dependent medication). Hydrocortisone is taken in two or three divided doses through the day, usually with a higher dose in the morning and a lower noon and/or evening dose. Fludrocortisone is also slower acting so is only taken once a day. It will be useful for school to also have a supply of the hydrocortisone tablets within school. A child with Addison’s disease should have an emergency kit prescribed by a doctor, and this will need to be stored safely within school. This should accompany the child on all school trips. A child with Addison’s disease should wear a medical bracelet or jewellery to inform people of their condition. One of the most common symptoms is fatigue. A child may not be able to participate in all the activities within school. Please be patient with them for example, if it’s a PE lesson and they cannot participate in the physical activity they may be able to contribute in other ways. Be mindful of the environmental factors such as crowded corridors and travel time between lessons etc. Where a child returns to school from hospital or extended absence it may helpful to negotiate a timetable to reintegrate the child back into school effectively. Sometimes the child may require rest breaks in between activities. If the child attend’s secondary school, it may be a good idea to provide them with a late card and toilet pass and ensure they have access to all teaching material when they are absent. During exam times a child with Addison’s disease may be anxious and may need extra hydrocortisone medication. They may also need rest breaks between exams or assessments. It’s a good idea to discuss access arrangements with the SENCO at school. An individual healthcare plan should be created with the child, parent/carer, healthcare professional and school. It will provide clarity about what needs to be done, when and by whom. It should be easily accessible to all who need to refer to it while preserving confidentiality. The plan should aim to record all important aspects of the child’s medical condition: symptoms, medication, warning signs to look out for and any additional treatments, as well as identifying the nature of day-to-day or emergency care and support needed. The Plan should be reviewed annually but can be amended at any point there is a change to the child’s treatment. Where the child has a special educational need identified in a statement or EHC plan, the individual healthcare plan should be linked to or become part of that statement or EHC plan. You can download the templates produced by the DFE here these can be amended to suit the child and school. Loss of memory – address, the name of their class teacher, etc. Collapses or large decrease in blood pressure. If school staff have received training to administer the emergency injection they will do so to a child who vomits or is severely injured. If this is not possible the school will call 999 and request an Ambulance immediately.